In the heart of Chiang Mai, Northern Thailand, there is a gay sauna, fitness and relaxation centre for men, unique in the world for it's friendliness, comfort, ambience, fraternisation and service. Visitors may share the delights of a beautiful tropical garden setting, enjoy swimming laps of the secluded pool, tan in the sun, or just simply enjoy a drink by the pool side whilst meeting and making new friends. The gym offers plenty of opportunity for working up some fitness, or you can sweat it all out in the steam room. Visitors are free to stroll around the garden, maybe cool down in the bar sipping a drink or two, enjoy a light snack (priced to suit the pocket) or simply just relax and watch the world go by. The magnificent Thai teak mansion and its tropical gardens have been very carefully maintained, and from the salahs by the pool and upstairs on the balcony, guests may lounge with friends and overlook the indoor garden, the fountain or the pool. They may also swim by sunlight, moonlight, and by the glow of the many lights scattered around the pool and gardens. House of Male is conveniently located on the city edge (by Kad Suan Kaew), in the quiet end of a Soi with ample parking. It is open every day, 12 noon to midnight and there is a Tuk Tuk service available, if you do not have your own transport. Visit soon!!!! During January we have Thai style barbecues each Saturday afternoon. This is a neat place, with a nice pool, and very private. You wouldn't know that you were in the middle of a city. I would suggest going on the 2 for 1 nights...get there about 4:00 and watch the action as the crowd grows at 6:00. There are usually a lot of local boys there on those nights, and lot of eyecandy...and of course more if you wish!! get there about 4:00 and watch the action as the crowd grows at 6:00. There are usually a lot of local boys there on those nights, and lot of eyecandy...and of course more if you wish!! I have been there a few times and almost always have a great time. A lot of guys use their swimming pool. The 2-for-1 nights seem especially popular with students and the university is not far away along the road going to Doi Suthep. My only complaints are that more mosquitos seem to get me than cute guys and the dark room upstairs is exactly that - totally dark. You can see nothing. Remember to take the directions in Thai. Although a lot of tuk-tuk drivers know where it is, some don't and you can end up going round in circles for a while. 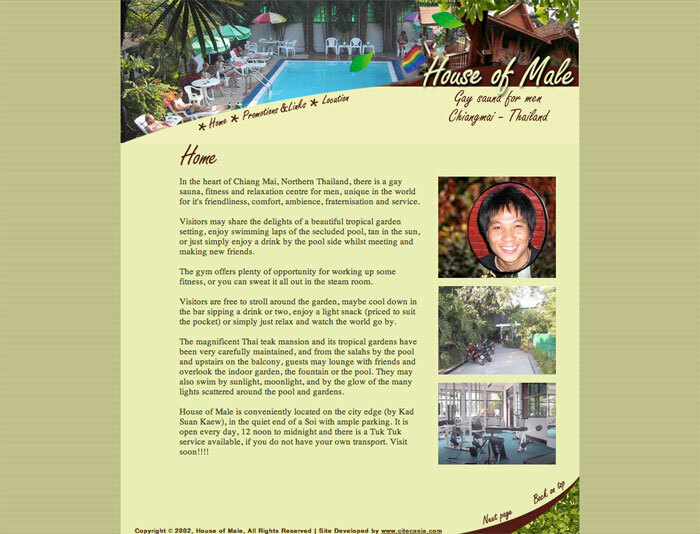 I think 99% of the tuk tuk drivers in Chiangmai will get you there if you simply say "House of Male." It's been there forever and they all seem to know. Or ask the driver to take you to "Soi 3, Siramangkalajarn" and it's down at the end of that soi on the left. I've only been there once (with the bf) and we went swimming in the pool....which is rather pleasant (and there was some eye candy around the pool). And even there the bf continued with his lessons for me (he was shocked when I dropped my knickers in the lockerroom to don my swimsuit - and so I was compelled to wrap a towel around myself before putting on the suit beneath the towel!). Lol. Yea, it's a long word...but not that hard to pronounce if you make an effort. Haha! I think it's always useful to have directions in Thai - just in case.